It was a challenging day at work, and I was looking forward to a nice jog in Robin Hill Park in Sequim. So I opened up the sliding glass door to my deck and walked across the back yard where I opened the gate to the winding serene trails of Robin Hill Park. I took the 2.4 mile loop, which gently meanders through the trees and across meadows, falls into a sweet little gulley and works its way up and around to my back yard again. I didn’t see anyone. I rarely do, although I know others are out there walking, jogging, riding their bikes, and some are riding horses on the trails designated for that purpose. The sun was already low in the sky as evening approached, and the beams of bright light were streaking through the pine trees, which were emitting the fresh scent of pine needles and all things green and woodsy. 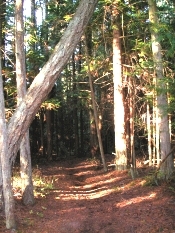 The 195 acre park is maintained by Clallam County and is almost hidden from public view. 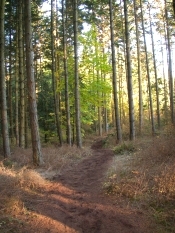 The Olympic Discovery Trail runs alongside the park stretching for many miles in either direction. There is no limit to how far I can walk, jog, or ride my bike, except my own physical endurance. Hmm. No wonder I love living in Sequim. 2 Responses for "Robin Hill Park in Sequim Washington"
Very nice information. Thanks for this. You really have a very informative site, thank you for sharing! Robin Hill Park is probably one of Sequim’s best kept secrets. Love the trails and walking them with our dogs.